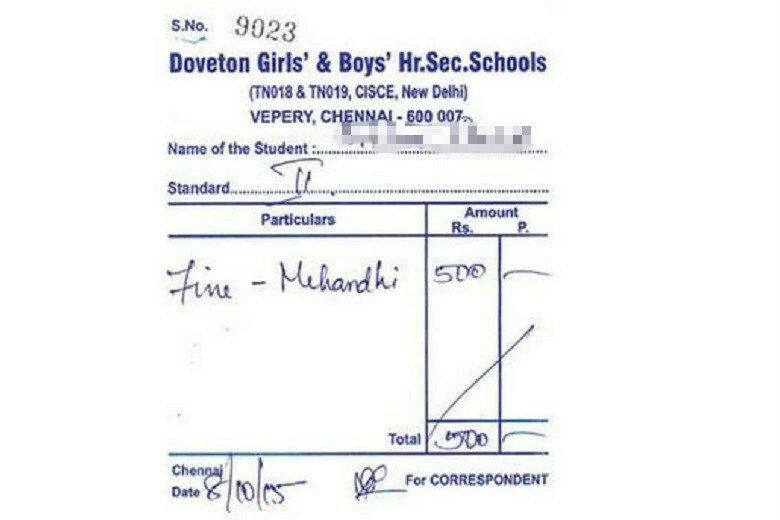 The picture above is a receipt of a Rs 500 fine imposed on a student for coming to Doveton School with a Mehandi – a temporary Hindu tattoo. The school is run by Doveton Protestant Schools Association one of the oldest schools in Chennai. The details of the incident can be found in this news story. These incidents are becoming commonplace around the country just recently Hindu girls in Kanpur were severely punished by St Marys Convent for wearing a pagan string called Rakhee. Hindus tie this string to symbolize a brother sister bond on only one day every year. Similar restrictions are in place in most schools and by and large the Hindu student body abide by these rules. When the father of the 7 year old protested, this is what the Christian management had to say. Prima facie this counter argument made by the school sounds impeccable. The exact equivalent would be “Why are you buying our product if you don’t like it” argument made by free market supporters. I try to analyze whether this argument has merit in this article in light of India’s unique sectarian laws governing education. It is important to see this issue from the Christian school management point of view first. Bindi – a dot on forehead of Hindu girls, Vibhuti – a sacred ash mark, Sandal paste, Mehandi – the temporary tattoo for which the boy was fined – are all markings on the body. There may be many Christians willing to accommodate this but there may be many others for whom these are satanic symbols. If you are concerned about coercion of students into abandoning pagan symbols it is also fair to worry about coercing the school management into accepting satanic symbols. Now I am not sure if in this particular case students are forced to sing this hymn, but this would be a useful example to analyze the issue in the general case. Suppose that such a hymn were to be sung as prayer – would that be acceptable ? Even though there may be no coercion to sing along it is still jarring because the song clearly talks about destruction of non-believers. On the other hand – does the school NOT have the liberty to sing whatever hymn they want ? We need to first sort out not if the school is Christian or Hindu but to determine if the school in question is public or private. This determination is not as simple as you would think because it is not just about the ownership but about whether a given school is ‘affected with the public interest’ and therefore is expected to pull back and behave in certain ways. First let us see how this rights dilemma would be resolved in a “Rule of Law” country like the United States or any of the advanced countries. Next we will consider the skew introduced by the “Idea of India” legal regime due to its sectarian processes. Finally we will try to model the current education situation in India in terms of contract. The secular test for symbols is whether there is any functional impact on other children that somehow distract the teaching/learning experience. For example you may not allow a kid to wear a sombrero or a distracting Jedi costume to school. This could block the view of teachers and obstruct other students. Similarly loose and skimpy dresses could be unsafe or lead to unwanted problems. The local customs prevalent in the territory where a school is located dictates a lot of what is acceptable even in these cases. In India, Hindu symbols like Mehandi, Bindi, do not have any functional impact at all. The only argument against them can be religious. Prayers can be as sectarian, warlike, or denominational if the school is private. Advanced countries take great care to clearly demarcate the public from the private. USA for example goes to great length not to fund private schools – even to the extent of questioning grant of library books and school bus routes ! When the institution is public the rules for prayer are simple. Apart from a prohibition on proselytization, prayers that ..” denigrate nonbelievers or religious minorities, threaten damnation, or preach conversion,” would not be permissible . So in advanced countries the question reduces to : What are the rules to determine if a school is public or private“. Is it Private? Do whatever you want (subject to general rules for public order, sedition, and the other good stuff). Public ? Play by non-sectarian rules. As mentioned earlier, the Christian school management is essentially making a business analogy when he says “Why come here if you dont like our rules?” One can argue that unlike a grocery store, a school by nature of its activity is automatically ‘affected with the public interest’ and therefore must be subjected to fair and non-discriminatory regulations. However, let us concede that point and treat the school as a business. Now if a business (like our school here) is affected with the public interest it does not mean the government owns and runs it. It usually means that the rates charged must be fair, non-discriminatory, and reasonable. Each of these terms are precisely selected by western judicial scholars. ‘Non discriminatory’ means you cannot select your customers for special treatment. To give you an example :Airtel holds a license from the govt which controls a natural monopoly of airwave spectrum – hence they cannot offer special rates to Punjabi Males and then say “If you dont like this policy go to Idea”. On the other hand a private wholesaler can offer special rates and finance packages to groups because due to absence of licensing or a monopoly situation he is free to use his best business judgment and discriminate. The above is just obvious and most people just ‘get ‘ this at an instinctive level. Unfortunately, in India I do not know where the planes of agreement are anymore. This may be obvious but are people willing to scream if these principles of private-public separation are violated? The obsession in the west to separate the private from public domain especially in education is due to the recognition that separating the Church from the State must involve the domain of public education first. It is through education in schools that a culture can replicate itself, the school promoters gain stature in society, can use the school assets funded by the taxpayer for structured bargaining in other economic areas and so forth. Barring the few sparks of tension this has worked beautifully for the west. Now lets turn to India. If you believe that school education is the chief method of cultural reproduction is follows naturally that controlling this activity will be a target for those who think strategically. 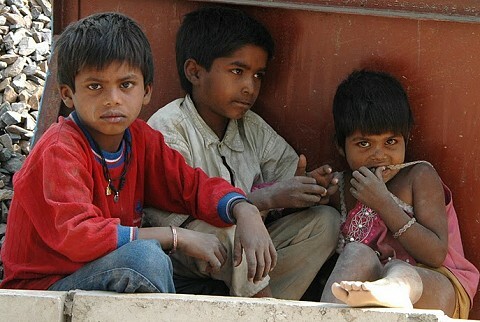 The 10 Billion dollar secret of India’s education law is that it is sectarian and rooted in religious discrimination. This is how it works for those learning about these things for the first time. India’s constitution has a ‘protective’ shield for minorities in two clauses called Article 29/30. The reasonable reading of these articles is that religious minorities shall be allowed to run their schools and colleges which are essential to preserve their culture. Over 60 years this simple clause has been the subject of such vexatious litigation as huge benches of supreme court judges tied themselves in knots over the issue. Since there are no principles being discussed the whole issue tilted to progressively favour minorities and subject Hindus to ever tightening regulation. This is due to two pulls. First the failure of the socialist state to provision education led to the state taking from private effort. Next this was challenged at each step as minority runs schools repelled each of these efforts that Hindu run schools could not. In early 2000’s a total of 21 judges of the Supreme Court in marathon deliberations over 3 years in TMA Pai series finally ruled that minorities have same protections as Hindus and are not on a higher pedestal . With this everyone thought the matter would rest. The Congress government however immediately upon getting elected in 2004 struck back with a vengeance and passed the 93rd Constitutional Amendment which obliterated the judicial consensus and restored the anti-Hindu tilt. The 93rd Amendment then enabled the innocuously named “Right to Education Act” which imposes toxic burdens and loss of autonomy for Hindu-run schools while exempting in-toto Christian and other minority run schools. I have written about this extensively in this article. The current situation in India is split along minority/Hindu and aided/private axis as follows. If you are an aided Hindu-run school – you need all of the above and you need to cede management control to school management committee. Essentially a shell. If you are minority unaided school – you have full autonomy and the RTE does not apply to you. The NOC process is extraordinary because you can approach NCMEI that Hindus cannot. If you are a minority aided school – you still have full autonomy except some very basic service conditions for teachers. You can see how the Idea of India completely destroys the carefully constructed common law principles of ‘affectation with public interest’. If you are a minority – even if you run on public money you are treated like a private enterprise. If you are Hindu running the school without any government help – you are considered a public establishment. Post Pramati Educational Trust vs India  the 93rd amendment was held to be valid and the minority both aided and unaided were exempted from the RTE Law, we can try to model the situation as contracts. One of the key formalities if you want to operate a school is the requirement of NOC (a No Objection Certificate – a license kind of). The NOC alongside an array of mind numbing procedures also stipulates a exclusivity question “Is there an existing school nearby“. Does this sound familiar ? Yes due to the geographical exclusivity these schools are operating under a franchise from the state. I am ignoring another license called the “Essentiality Certificate” that have similar terms in some states are not required of Christians, Muslims, and other minorities. In Delhi only Hindus need the EC as shown in the official rules below. Maximum Autonomy Franchise (Platinum) : Run the school however you want subject only to public order. Full autonomy in teacher hiring , selection of students, and fees – subject to basic controls only. State will ensure franchise exclusivity by distance criterion for NOC from competitor. You are allowed to perform any kind of prayer and force any kind of dress code and symbols on student body. Can fine and expel. Medium Autonomy Franchise (Gold) : Run the school with major autonomy subject to basic service conditions for teachers. Some fee control, autonomy of selection of students for at least 50%. State ensures franchise exclusivity. You are allowed to select teachers, force any dress code and invoke any prayer. Low autonomy (Copper) : Run the school under very specific rules under the Right to Education Act. Lose autonomy for selecting students, force cross subsidy to make up for deficit induced by state. Still retain autonomy in some management matters. Strict non discrimination rules under watch of hostile civil society jury means you cannot enforce uniformity or fee payment. No autonomy (Clay) Franchise : This type of school is private in name only. All rules of Right to Education must be followed. Fees are fixed, teachers are appointed by caste quota and external govt agencies, teachers cannot be terminated. Management is illusory as real control of these schools are with the School Management Committees. The mere fact that you have four types are franchises does not make them wrong or suspect. You could imagine that based on geographical and backwardness issues you can allocate more or less autonomy in exchange for government money or in line with social objectives. Once you lay out these types of franchises the question is what are the qualifications for obtaining one of these franchises. If you are Hindu you cannot get Platinum and Gold franchises – even if you offer to foot the entire bill. The maximum you can get is a Copper Franchise. If you are a Christian , Muslim or other minorities the minimum you can get is a Gold Franchise. Would you recoil at such an atrocious rule ? This is exactly the situation in India. This is not perpetrated by Sadhvi or Yogi but by modernists, liberals and think tanks support. Once you model the situation as above you can see where the Christian management draws its arguments from. Despite taking advantage of the virtual monopoly granted by the NOC, the exemption from uniform law, and preferential treatment in allocation of franchise, they do not consider themselves to be ‘affected with the public interest’ and are therefore bound by only by private rules of business. I have been an observer of various laws and institutions in India on this blog for the past 10 years. India’s education law is spectacularly isolated in the world – there is no country where the majority community faces special burdens by law in this sector. The education law is also remarkable for the complete absence of comment in Indian intellectual, think tank, and liberal circles. For example the Pramati judgment which is of such a monumental nature overruling 50 years of evolution of jurisprudence and stamping finality to sectarian consideration in education – spurred no debate at all !! Even on social media if a handful of us stop talking no one will even know that such laws exist. In a way this is the best example of the liberal bigotry , a close mind without any curiosity. Free speech in its full definition allows the uninhibited discussion of *ALL* aspects, events, and laws. I call this the business end of Idea of India. As of today about 44 Indian “intellectuals” have returned their Sahitya Akademi awards. 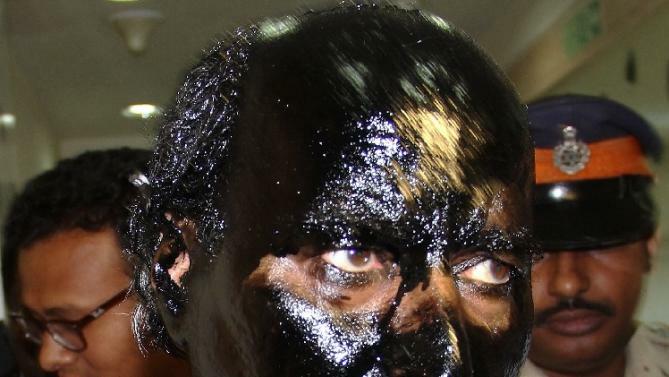 The media which had just got off an outrage cycle on the Dadri murder found a great follow in when Former BJP thinker Sudheendhra Kulkarni was splashed with ink during a book release function in Mumbai. Joshi said that Monday’s attack on Sudheendra Kulkarni was regretful. “The ink that we use for writing books is being used to attack writers. This is a very short post that contrasts this ink splash attack with another one during Sonia Gandhi’s heyday. Now this was a 60 year old man, who had come to court to fight Chidambaram Natarajar case. This is what a real attack looks like. What did he do ? He wiped the eggs off his face – then eventually went on to win the case. NONE of the current intellectuals raised their voice at that time. Shashi Tharoor was very much a rising star of the ruling Congress party then as he is now. There was no call for Sonia to say something. All those who are returning the Sakitya Academy awards today had the award then too. It never moved from their mantles in their drawing rooms. 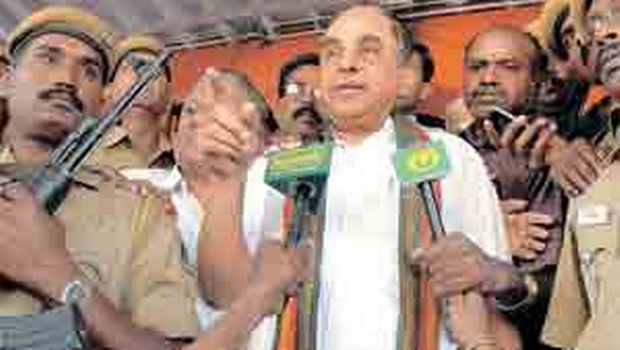 Our media probably even found the whole thing, an egg dripping Swamy hilarious. In contrast, Sudheendhra baited trouble by conducting the show in Mumbai a victim of terror attacks like no other city. From all accounts it seems like there was no assault involved. He just got down from his car and calmly got his face painted with ink. What about murder of rationalists ? We will get to that later. Just let the contrasting attacks on Swamy and Kulkarni and the deluge of hypocrisy sink in ! This is called the no-detention policy currently in the crosshairs of the Union HRD. Most states want this repealed, the policy experts who designed this during UPA rule are predictably crying murder. In this article, I will remove some of the misleading jargon and clear the smoke from this debate. Hopefully at the end you will see the sheer scale of horrors that have been inflicted on the education sector. It is extremely important to state in clear terms what one is up against, even more than the position favorable to ones own. In case of the no-detention policy we need to actually get a hold of what it is they are proposing in a more direct vocabulary without falling into the trap of terminology. The task starts with the following observation. The opposite of hot is not no-hot. It is cold. The opposite of detention is not no-detention. It is social promotion. What on earth is ‘social promotion’ ? Thanks for asking that. See, we are already on the path to freedom by starting to use precise terms instead of a negative. What is no-detention will just be met with “You know what is detention? It is the opposite of that”. And that opposite of detention is the law imposed on 400 Million kids in the country of India. The opposite of this is called Grade Retention or Detention. This is the practice of making a student repeat a particular grade if they have not attained the basic learning level for that grade. A variant of this is the so called double-promotion where gifted kids can accelerate to join older students. The pros and cons of both policies are easy searchable on Google. Let me just state them here and put them in the context of the countries and cultures they are sought to be implemented in. Before we dive into “policy wonkery” mode we need large strategic vision points rooted in reality. I list a few below. India is not like Norway, we are a developing country with real constraints in teaching, measurement, and infra. India cannot afford mediocrity as the normative vision because a culture of excellence pulls up the median and a culture of mediocrity pulls it even further down. India has a sectarian legal regime in education unlike any other country. Any “policy think tank” that ignores the legal landscape is just plain dishonest and probably corrupt. I will come to this at the end of this post. Social Promotion : The main argument is that making a student repeat a grade adds to mental stress, lowers their self esteem, and could cause them to drop out altogether. The UPA govt supported by every think tank justified it as – “because examinations are often used for eliminating children who obtain poor marks.. Compelling a child to repeat a class is demotivating and discouraging”. To replace tests, a system called CCE (Comprehensive and Continuous Evaluation) was introduced. ( See “Jiten gulped his tiffin” ) One might wonder what does CCE have to do with no detention. If CCE is just another form of testing, maybe holistic- what if a student shows deficiency in that too? CCE is just a way of assigning high enough weights to non learning factors such as social, personality, attitudes and values displayed. It would then be impossible to separate the wheat from the chaff and measure to any degree of robustness the actual learning that took place vs the other parameters. The biggest lie peddled by the experts is that social promotion is the ‘settled’ position all across the world. In USA this is still a burning debate. With all its money, high quality of teachers, and heated swimming pools in public schools – school districts from Chicago to Florida to NY, retention and exhaustive testing is the norm. Not social promotion. The testing happens for science, math, english not on extraneous secondary effects like attitudes and values. Indians should not be misled into believing that USA partisan politics is at the same level as that in India. Democrats and Republicans are not very far off when it comes to the issue of testing. Florida improved its reading scores dramatically after grade retention and now outperforms every state on fourth grade reading test. Canada, Germany all wealthy countries do not have a mandated social promotion policy. The single most notable feature in Indian Edu law (ignoring the sectarian nature) is that these burning debates which are happening in the academic circles and in state legislatures are presented as if they are settled issues when the experts return to Delhi. There is no evidence I can find online that our experts in UPA – to be fair the BJP opposition to – have considered any of the global trends and placed them in a third world context. Social promotion works in developed countries and in upmarket schools that are equipped to deliver what is known as ‘tracking’. Tracking is the process where a teacher is able to handle a class with a wide spread of abilities in kids. The learning levels of each kid is tracked and the appropriate lessons are tailormade. For example a high achiever in Class 5 is encouraged and kept engaged by giving her a tougher homework than a boy who is tailing. As you can see this requires a very high level of teacher training. The stakes are very high because remember what I mentioned earlier, you simply cannot afford to drop the high achiever. These are your future ‘load pullers’ of your country in various sectors from sports to social science to inventors. You also need extremely proficient principals who can monitor these teachers. It is easy to slip up and teach to a low-average level. The high achievers are pulled down but they clear the tests of course but could display attitudinal behaviours due to the ennui that turn into low marks on the CCE value part. Now think if this is possible in India? Teachers are barely trained, only 4% clear the Teacher Eligibility Tests. Experts and thinktanks are now blaming it on “implementation”, in my view this is an irresponsible behavior. Did they now know what works in Finland cant be transported here ? You may be trained by the Idea of India ecosystem to denounce my mention of achievers as “Brahminism”- you may use words like “Elitism” to couch that even. Beyond name calling, we should learn to recognize the key assets if you want to turn a third world country by leveraging human capital. Behind every success story such as Apple, Google, or now Huawei, there will be a tiny core of very high talent. Others build around that core and supply diversity. No nation has been built pursuing mediocrity or excellence in “values”. The USA even has “magnet schools” where gifted kids are simply brought together and challenged. Other countries have variants of this too. The selection to these schools are highly competitive. The Right to Education Act on the other hand bans all screening. I have documented the case of Jnana Prabodhini schools for talented children in Pune which have been suffocated. The UPA’s focus on abolishing exams even at Std X level, grading instead of marks at all levels, CCE, the continuous denouncing of “coaching” and portraying standardized exams as anti student have had a traumatic effect. Social Promotions, see I am no longer a prisoner to their terminology ‘no-detention’ , have an even more adverse effect on the equity aspect. The same folks who scream equity from every corner have perpetrated a criminal act of crushing those who do not have access. A mere 25% quota in a tiny subset of Hindu run schools selected by lottery is a sick joke that needs condemnation. What about the losers of the lottery ? These simple questions are not asked by their think tank friends who are supposed to supply a level of intellectual checks. Things being the way they are – the answer should seek to play to the current situation in teaching. Teachers today can be expected to teach to a compact cohort and teach towards a test. A compact cohort means the students in a class are not completely off in abilities. The testing part is still evolving but can be sufficiently well designed that it can pick out at the top as well as at the bottom. Social Promotion blows both these things out of the water. Today a teacher, not in Lutyens but in Sullurpeta, at Class 6 is expected to teach a class with some students with Class 2 level learning. Some experts on Twitter have the nerve to say “Fail the teacher, not the student”. How about “fail the activists” for thrusting this policy down this nations throat ? In most cases, the teacher either fails or simply drops down to the level of the kid with the lowest ability. This is where the next crime happens. When the class standard is lowered, the talented kids get bored and display erratic behaviour. Now watch what happens. The kids whose parents are educated themselves will be challenged at home. I’ve seen so many kids at airports working out various Japanese maths worksheets (Kumon). The kid without this background is basically lost. The talent could be gone forever. I have received comments from bright school kids who bemoan the lack of differentiation in CBSE Std X post abolition of exams. This is the worst form of propagating privilege. The hapless teacher however has no choice – she is already trapped by the CCE which has to take into account extraneous factors. Detention does not mean every kid is detained. There are no numbers – which is another area the experts are now pretending to be anguished after supporting the RTE. My guess is that only 3-5% kids will be detained. With social promotion, kids and their parents are guaranteed a ride till Class 8 so while the upper class can keep tabs on things, the lower class masses tend to take the eye off the ball. They have no idea what is happening in school. Before you teach me about PTA feedback meetings – this is not how it works in the mass schools. A kid who fails in mid terms is usually shaken up and tends to work harder to avoid staying back. Even more importantly the teacher can identify kids at risk of staying back and feed that info back to the parents in addition to tuning her own attention. The ‘experts’ are dreaming if this kind of seriousness will still be around if the Law makes it Illegal to keep any kid back. The teachers, the kids, and their parents will simply slack it out. Currently the RTE stops at Std 8. I am telling you right now that this is a bogus stopping point. The Congress Govt just kicked the can a little further down the road. But if this were to be the end of RTE, then it follows that a mass of students will flop out over the cliff. By that time – it is too late. The only solution is either to extend the RTE to Std 12 which Sibal has hinted at or to employ extremely easy testing or to add in extraneous ‘value’ factors to get the mass of kids over the ropes. Social promotion is simply a bizarre idea in the context of a third world country of India’s size and aspiration. It is simply stunning that such a wide impact law that strikes at the very heart of our future has been passed with so little comment. Five batches of kids have passed. Are you an expert ? Have you done field work? In an article called “Merits of No Detention” Anurag Behar, CEO of Azim Premji Foundation cries foul. That IT-Waity Types like myself are intruding into expert territory. His line is – leave it to experts to design the Air Traffic Control system and amateurs should keep out. This is shockingly ignorant. It confuses separation of labour type of expertise with its more general cousin. I may not know how to design a radar but I will cry murder if someone suggests a traffic signal on the runway for airplanes and forces me to accept that just because he is an expert soi-disant. PS : Minorities are exempt from social promotion provision. Because the RTE Act lock stock and barrel is not applicable. (Ref : Master Srikanth v Principal Frank Anthony Public School Bangalore KA High Court Judgment) I am not even going into the ramifications of this in this post. It just means teachers in RTE exempt schools will be more effective by law.